COPD is a group of progressively debilitating respiratory conditions, including emphysema and chronic bronchitis, and it ranks as the third leading cause of death in the United States, according to the CDC. About 16 million Americans are currently diagnosed with COPD, but another 14 million or more remain undiagnosed. In addition, COPD accounts for nearly 2 million ED visits each year, but much of this data is confounded by asthma admissions. “COPD patients who require ED attention or hospitalization are those with the most severe disease,” explains Reynold A. Panettieri, Jr., MD. “Furthermore, hospitalization and ED visits for COPD are more often clustered in the winter. They are associated with exposure to viruses and bacterial pathogens.” People aged 50 and older are more likely than others to get COPD, but the damage starts years before these individuals are diagnosed and can progress even after smoking cessation. Since the disease occurs and is diagnosed later in life, the risk of COPD is especially high for patients older than 45 with a smoking history. Most patients with diagnosed COPD report that symptoms of their disease impair their quality of life, but only about half take at least one daily medication for COPD. The healthcare utilization rate for COPD patients is also substantial. About one in five COPD patients visits an ED or is admitted to a hospital for care within a year. Recidivism in healthcare has been defined as the tendency by ill patients to relapse or return to hospitals for treatment. Within the realm of COPD, recidivism remains particularly problematic, especially with regard to readmissions. An AHRQ study of patients aged 40 and older with COPD revealed that more than 7% of index admissions were followed by at least one readmission within 30 days for a principal diagnosis of the disease (Table 1). This rate jumped to more than 17% when COPD was listed as any diagnosis (principal or secondary) during a subsequent hospital stay and to over 20% when all-cause 30-day readmissions were considered. Nationwide, greater efforts are needed to educate healthcare personnel on effective strategies for diagnosing, preventing, and managing COPD in order to avoid recidivism. When diagnosing COPD, the Global Initiative for Chronic Obstructive Lung Disease (GOLD) recommends performing spirometry if any disease indicators are present in patients aged 40 and older. Indicators include dyspnea, chronic cough, chronic sputum production, a history of exposure to risk factors, and a family history of COPD (Table 2). These indicators are not diagnostics themselves, but their presence increases the probability of a COPD diagnosis as more indicators are spotted. GOLD also offers recommendations for how patients with COPD should be assessed during their hospitalization and when they should be admitted for further evaluation and care. Those with a marked increase in symptom intensity and severe underlying COPD should be admitted. If there is an onset of new physical signs or failure of an exacerbation to respond to initial medical management, an admission is recommended. Other important considerations for hospitalization include older age, frequency of exacerbations, and insufficient home support. “The patients most likely to require rehospitalization within 30 days of a COPD exacerbation are those with comorbidities and the most severe disease,” adds Dr. Panettieri. When considering hospital admission, the presence of serious COPD comorbidities is critical to avoiding recidivism. In addition to smoking, common co–morbidities include heart attack, stroke, lung cancer, osteoporosis, skeletal muscle loss and weakness, weight loss, depression, and metabolic syndrome. 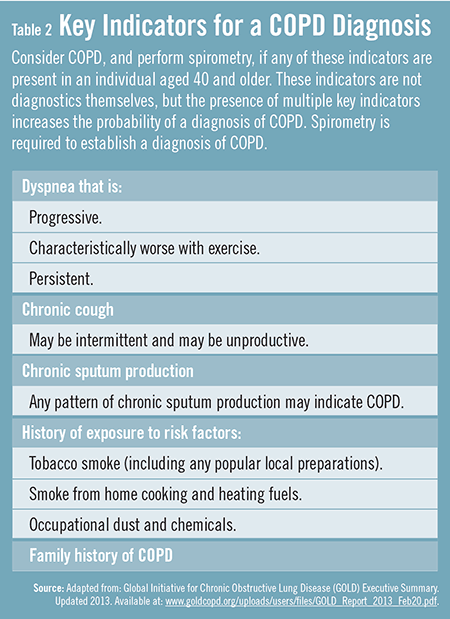 These comorbidities should alert physicians to seek and address risk factors in COPD patients. Caring for comorbidities can improve quality of life and ensure that treatable conditions are addressed. Information on comorbidities can also help physicians gain a better clinical picture of patients who are likely to be readmitted to the hospital or ED. Global Initiative for Chronic Obstructive Lung Disease (GOLD) Executive Summary. Updated 2013. Available at: http://www.goldcopd.org/uploads/users/files/GOLD_Report_2013_Feb20.pdf. EB Medicine. The acute presentation of chronic obstructive pulmonary disease in the emergency department: a challenging oxymoron. 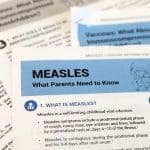 Available at: www.ebmedicine.net/topics.php?paction=showTopicSeg&topic_id=63&seg_id=1169. Han MK, Martinez FJ. Pharmacotherapeutic approaches to preventing acute exacerbations of chronic obstructive pulmonary disease. Proc Am Thorac Soc. 2011;8:356-362. Postma D, Anzueto A, Calverley P, et al. A new perspective on optimal care for patients with COPD. Prim Care Respir J. 2011;20:205-209. Available at: http://www.thepcrj.org/journ/vol20/20_2_205_209.pdf. Price D, Crockett A, Arne M, et al. Spirometry in primary care case-identification, diagnosis and management of COPD. Prim Care Respir J. 2009;18:216-223. Anzueto A, Sethi S, Martinez FJ. Exacerbations of chronic obstructive pulmonary disease. Proc Am Thorac Soc. 2007;4:554-564. Global Initiative for Chronic Obstructive Lung Disease. Global strategy for the diagnosis, management, and prevention of chronic obstructive pulmonary disease. Updated April 11, 2011. Available at: http://www.goldcopd.org/uploads/users/files/GOLDReport_April112011.pdf. Anzueto A. Impact of exacerbations on COPD. Eur Respir Rev. 2010;19:113-118. Available at: http://err.ersjournals.com/content/19/116/113.full. Wedzicha JA, Seemungal TA. COPD exacerbations: defining their cause and prevention. Lancet. 2007;370(9589):786-796. NextWho’s At Fault If a Patient Doesn’t Follow Up? Reynold A. Panettieri, Jr., MD, has indicated to Physician’s Weekly that he has worked as a consultant for AstraZeneca, Genentech, GlaxoSmithKline, and Merck, and has worked as a paid speaker for Advanced Health Media and IntraMed Educational Group. He has also received grants/research aid from the NIH, AstraZeneca, Boehringer-Ingelheim, Merck, and Roche.